The Royal Navy's newest £1bn warship has been handed over to the Ministry of Defence in a formal ceremony at its new base in Portsmouth. HMS Dauntless is the second of six new Type 45 destroyers to enter service. 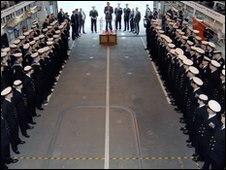 The flag of BAE Systems, which built the ship in Glasgow, was lowered and replaced by the Navy's White Ensign during the ceremony on the flight deck. The vessel arrived at the city's naval base for the first time on Wednesday, as hundreds of people looked on. On Thursday, it was handed over to the Royal Navy's Deputy Commander-In-Chief Fleet, Vice Admiral Richard Ibbotson. The ship was launched in Glasgow in January 2007 but has been taking part in nearly three years of extensive sea trials off Scotland. A Royal Navy spokesman said the Type 45s were the largest and most powerful air defence destroyers ever built for the Royal Navy. "It's such a complex warship that there are so many parts to test," he said. 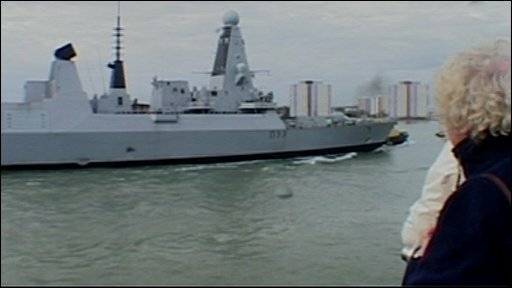 HMS Dauntless is the second vessel of its kind to be built as part of a £6bn programme. The first of the new generation of warships, HMS Daring, arrived in Portsmouth in January. The vessels are replacing the Navy's ageing fleet of Type 42 destroyers.